This time about healing broken hinges in SIBO Psions. It seems that this happens to be an issue in Psions too. David MacKay has written an exhaustive and excellently illustrated tutorial on how to repair the hinges. You may find it on his website, where several other useful tips can be found. It's not always a spring that breaks, sometimes (due to continuous strain?) 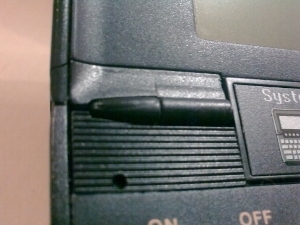 you get a crack on one of the sides of the button bar - and it's a good news as it's much easier to fix. You can read a brief repair guide here. You can download it from Gareth Saunders' website, as well as the OPL reference in various formats (including Psion's database file). 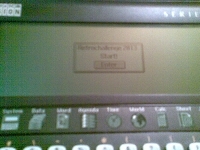 For learning OPL you can also take a look at the tutorials devoted to programming Symbian machines (this one, for instance). The 2013 Summer Competition has started and so have I - for the first time. For long I thought I would do something on Atari Portfolio, but at the end of June, when my Portfolio went dead (batteries) once again, I changed my mind. I'm waiting for the feedback from all Psioneers! Hearing from you that you still play with your Psions will greatly encourage me to do more.